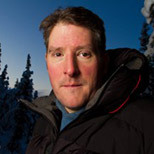 David W. Shaw is a science writer, photographer, guide and wildlife biologist living in Fairbanks, Alaska. Between travels, he can be found exploring the mountains and forests of his home state, poking under mossy rocks, and chasing birds with a pair of binoculars. Find out more about Dave and read his compelling science and natural history blog at www.david-w-shaw.com.